Blackberry Farm is a 4,200-acre working farm in the foothills of the Great Smoky Mountains, near Walland, Tennessee. Kreis and Sandy Beall bought the property in 1976 and over the years have turned it into an expanse of guest rooms and cottages that has been named one of the best small hotels in America. Today their son Sam runs the property, although Kreis still directs the design of all the guest rooms, often with the help of Atlanta designer Suzanne Kasler. She strives to make each room unique, "because I'd never design two rooms the same in my own home," she says. In addition to its beautiful setting, Blackberry Farm is known for its outstanding food. Much credit for this goes to Sam, who attended culinary school and also worked in the hotel, restaurant, and wine business in California. 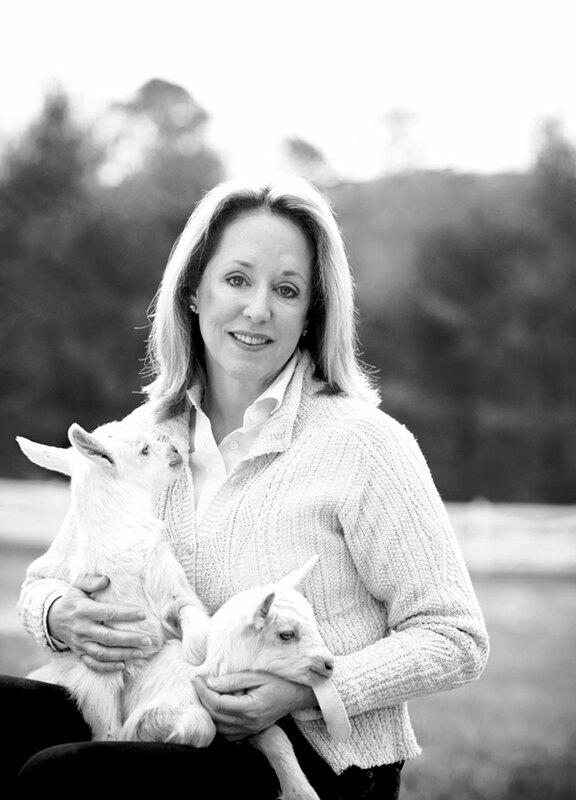 Kreis Beall and two of Blackberry Farm's cuddliest residents. The property's main farmhouse, which contains guest rooms. There are numerous small cottages on the vast acreage as well. Kreis furnished the new cottages and the farmhouse with a fresh mix of furniture styles, fabrics, and finishes, working with Hickory Chair. In addition to hosting cooking schools with chefs such as James Beard Award winner (and Traditional Home master chef) Suzanne Goin, Blackberry Farm offers its guests the Aveda spa, horseback riding, fly-fishing, canoeing-and the soothing relaxation of lounging in rocking chairs on cottage porches or the farmhouse veranda. A cloud-like bed in a luxurious yet rustically simple guest room punctuated with a bouquet of fresh flowers. Get set for summer with Smith and Hawken's painted adirondack chair, $139 (smithandhawken.com) and L.L. Bean's wellie boots in lapiz blue, $49.50 (llbean.com). No mountain getaway is complete without an alfresco meal. "Long Point" drink caddy, $195, "Seabright" blue votives, $75 for set of 3, and "Daniel" napkins, $38 each, all from Ralph Lauren Home (rlhome.polo.com). Stroheim "Piermont" washed matelasse, to the trade (stroheim.com). Combine neutrals with soft hints of color to create a soothing palette a la Blackberry Farm. Colefax & Fowler's "Bennington," to the trade through Cowtan & Tout (cowtan.com). "Pembridge Stripe," to the trade through Cowtan & Tout (cowtan.com). When dining outdoors, why not add some spring bling? Anthropologie's "Wild Cabbage" dinner plate, $16, cup and saucer, $18, and "Grecian Garden" plate, $12 (anthropologie.com). Bring home that spa feeling with Mor Cosmetics' Jasmine Tea bath tea, $30, soap, $15, and eau de parfum, $50 (morcosemetics.com). Add a bit of whimsy to your bath with Angela Adams' tile from Ann Sacks. From right: "Munjoy" and "Fern," starting at $16.39 each (annsacks.com). Patagonia's Pocketwire packs, $50 each (patagonia.com). Blackberry Farm is about 18 miles from Knoxville, Tennessee's McGhee Tyson Airport. Many guests fly into the airport and take a taxi or a shuttle to the farm. If you drive, head south from the airport on Highway 129 toward Maryville. Take Highway 321 north for 10 miles until the four-lane road turns into two lanes. Turn right on West Millers Cove Road. (No Blackberry Farm sign is visible from the highway.) You'll know you are there when you read the white picket fence. Call 800/648-4252 or visit blackberryfarm.com for information and more detailed directions.